Personally, I’m a paper book reader so it was a tad tedious getting through the first few e-pages. Bear in mind, I did not know this author, but the name had been mentioned somewhere before, so I did have a slight curiosity to her writings. I slowly trudged through the Intro as it mentioned early mornings and the most forbidden word in my dictionary: e-x-e-r-c-i-s-e. YES! YES! YES! My mind shouted! This is what happens! This is why we can’t focus, this is why we can’t get our MIT’s (Most Important Tasks) out of the way. It’s not simply a time management issue; it’s bigger than that and this is the secret! And this, is how I managed to read an e-book — cover to cover. Laura’s style is light and fun. This book was an enjoyable read, with a practical aspect incorporated and just the right combination of facts and anecdotes to provide good motivation and keep the practicality do-able. 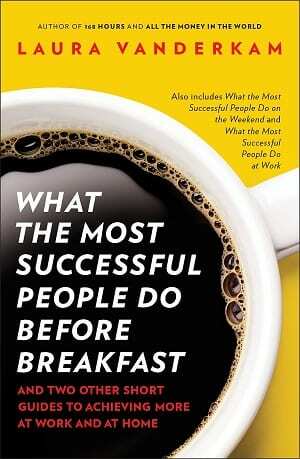 The high value activities that successful people do before breakfast are mentioned early in the book, so one is not kept guessing. That’s another thing I noticed about Vanderkam’s style, she gets straight to the point. “We all have 168 hours per week” she says. This also happens to be a title of another of Laura’s books. As an experiment, Laura kept time logs for every activity that she did throughout each day for a week. This highlighted a distinct pattern and gave the author reason to believe that mornings were made for getting things done. Add to that the matter of willpower and you get a good supply of energy. By now, you know what high value activities the most successful people do before breakfast, you know they do it in the morning, then there’s the added ingredient called willpower, and a good supply of energy … so what does that mean? Up to this point, you basically just learned the recipe for a fresh batch of optimism and internal motivation. These are 2 key factors when attempting activities or goals that have no immediate payoff or no worldly reward. Now this is only the means to an end. The emphasis is all on willpower. The more you conserve, the better the rest of your day gets. Conservation of willpower can be achieved by developing habits or rituals for your core competencies. At this point, you really want to get committed and circumvent any distraction that could cause an oversight of all the immensity that follows. The next 2 chapters address the real nitty-gritty. This is where all the success stories, habit changes and tangible secrets emerge. The 3 core competencies, from which the high value activities of the most successful people originate, are revealed. The 3 areas of life to nurture for success are detailed. Then, the finale is presented in a practical 5-step process that helps you take back your blessed hours and make over your mornings for success. Mornings: A new chance to do things right. The most successful people know that the hopeful hours of mornings are too precious for semi-conscious activities. When you make over your mornings, you make over your life.